Now this brings back some memories. Transport Tycoon Deluxe is a popular business sim, released many years ago. 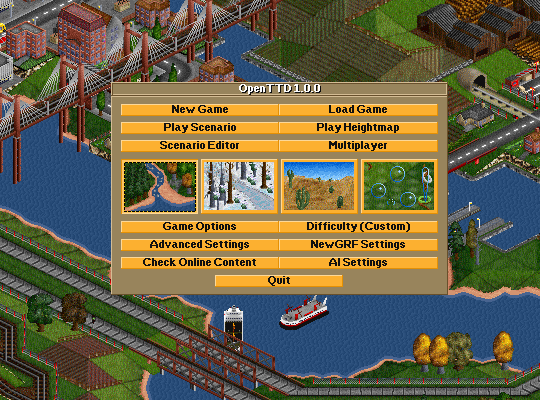 As some good games it had consolidated such a strong community of fans that it spawned OpenTTD – open source clone, in development for six years by now. And today it had reached 1.0 version. If you had managed to miss (hadn’t known about computers, wasn’t yet born, etc) original game – it is all about transportation. Game field is randomly generated landscape with cities and industrial objects. Your goal is to provide transportation and make as much profit as possible in span of the game time. OpenTTD itself is just an internal engine. Graphics and sounds can be taken from original game or open source version of those can be used. Quality is stunning. Original game is not only replicated, but also improved in playing experience and usability. It allows concept to shine, many years after initial release. Blast from the past comes with some technical limitations as well. Game is text-intensive and that text comes in windows that are very small and poorly readable on modern screen. Hotkeys and experience will help, but Transport Tycoon wasn’t exactly easy casual game originally and OpenTTD isn’t now. There is learning curve. It’s nice but it failed to install on my Ubuntu machine, and then it locked the updater…looks cool though. Sorry, Windows here, can’t help. :) Works fine for me and can even be made portable by copying config to game’s directory.